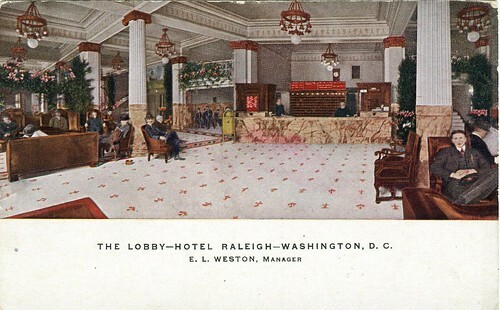 The Raleigh Hotel got its start in 1893 when the Shepherd Centennial Building on the northeast corner of Pennsylvania Avenue and 12th Street, NW, was converted from commercial use into the hotel by Washington architect Leon E. Dessez. The hotel expanded quickly. In 1897 three additional floors were added. In 1898 New York architect Henry Janeway Hardenbergh designed a major addition in the center of 12th Street to the north of the original building. The building was enlarged by Hardenbergh again in 1905. By 1911, the original building was considered too dated and razed for Hardenbergh’s new, Beaux Arts, thirteen-story main hotel building facing Pennsylvania Avenue. The builder’s demand for height caused Congress to change the height limit for Pennsylvania Avenue froom 130 feet to 160 feet in 1910. 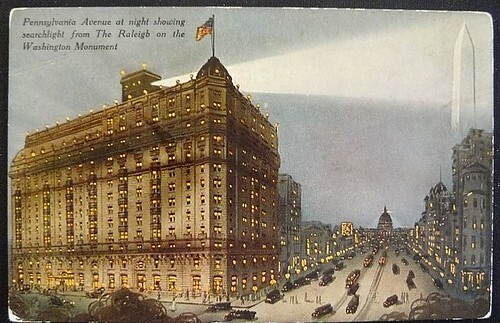 The Raleigh was well know for good food, drink, and entertainment. It was equally regarded for the beauty of its architectural details, such as the decoration of the gold-and-white ballroom on the top floor. It was a prosperous hotel, though it lost some of its business to the Mayflower Hotel when it opened. One of the factors that made the Raleigh such a success was its manager, Curt C. Schiffeler, who managed to create a warm and informal atmosphere that pleased the guests. Schiffeler remained at the Raleigh until he retired in 1954. By then newer hotels were drawing patronage away. The Raleigh was razed ten years later in 1964. This is a great image of what Pennsylvania Ave. looked like around 1908. The most obvious difference is that the street went through the current Navy Memorial. Other items of interest are Kann’s department store, the Central Union Mission in the back ground, and the spire of the Metropolitan Memorial Methodist Church in the distance which was razed in 1956. The Website Cinema Treatures povides the following history of the Metropolitan Theater, which was located on the south side of the 900 block of F Street. The Metropolitan was built in 1917. It was designed by architect Reginald Geare, who also designed the Lincoln and Knickerbocker Theatres. The 1400-seat Metropolitan had a three story Georgian Revival facade, with four sets of Doric pilasters below an ornately sculpted pediment. Between four sets of decorative friezes just below the pediment, the theater’s name was incised into the stone in bold lettering. Around the late 20s, a large marquee replaced the more simple original, somewhat obscuring the arched window over the main entrance. Also, a 60-foot tall vertical sign was also added at this time, with its top support punched right into the sculpture on the pediment. 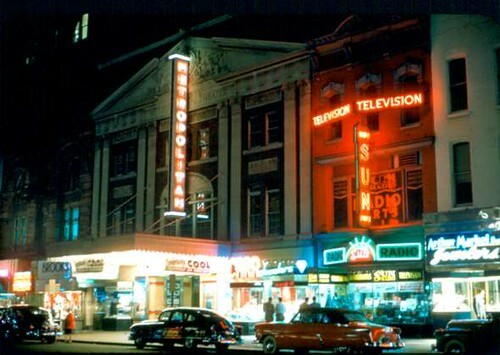 Up until the early 40s, the Metropolitan included live stage entertainment, including a house orchestra, in addition to movies. The theater was also the site of the Washington premiere of “The Jazz Singer” in 1927, the first theater in the capital to show a “talking picture”. A year later, the Metropolitan was acquired by the Warner Brothers chain, which it remained into the 50s. The theater received two massive remodels in 1954 and 1961 in an attempt to entice more movie goers with its attendance falling. Unfortunately, the Metropolitan closed a few years later, and was razed in 1968. Opened on November 4, 1918, the Loew’s Palace Theater was Washington’s first movie palace and the site of numerous early premieres. Loew’s was designed by architect Thomas W. Lamb as a 2423 seat single screen theater and was located at 1306 F Street, NW. In addition to motion pictures, stage shows began in 1926 and continued until 1932. The Loew’s Palace Theater was also reportedly the first DC movie house with air conditioning which was installed in 1926. As the theater began to decline, Loew’s spent $225,000 to renovate the theater in 1964 which changed the paint, walls, and carpeting at which time orchestra and balcony wall boxes were also removed. In 1968, a robbery occurred in which two people were shot and wounded and a year later Loew’s put the old movie palace up for sale. Then: ca. 1910, the W.B. Moses & Sons building. W.B. Moses moved to Washington from Philadelphia during the Civil War, and within 50 years established the largest exclusively retail furniture, carpet, and drapery business in America. W.B. Moses settled on the corner of 11th and F in 1884, and the building was added on to in 1887, 1889, 1898, and 1906. Now: Yet another, largely nondescript office building. The Empress was located at 416 9th Street, NW, and opened in 1910 for motion pictures. It was a 400 seat house designed by architect B. Frank Meyers. It was completely renovated in 1915 after only 5 years of service. In November of 1920, the Empress Theater was sold to Marcus Notes, and on February 1, 1936, two film operators were burned and a panic narrowly averted when a fire broke out in the projection room. The theater lasted until 1945, and was later demolished.